Q1) Thank you for coming to Japan. This is your first time to present your work in Asia. Smart Illumination Yokohama will be a great opportunity for Japanese people to get to know NUMEN/FOR USE and its artwork. Please let me start with a few questions about the artist group, NUMEN/FOR USE. What sort of group is the NUMEN/FOR USE? Where did this name come from? -　We (Cristoph, Nikola and myself) started the group under the banner For Use back in 1998 when we were still in college of industrial design in Zagreb and Vienna. Monicker "For Use" came from our then obsession with functionality and reductive design.A year later we established Numen as a collective identity covering all projects actualized outside the sphere of industrial design. "Numen" derives from some esoteric literature we used to read at the time - "noumenon" means a transcendental object, one graspable without the use of senses - ie. the opposite of phenomenon. Q2) Please tell us about your current artwork as well as your past work. NUMEN/FOR USE has produced numerous interactive artwork where the spectators could participate in. The current exhibit also has the same concept in that the spectators can be part of the artwork and enjoy the experience. However, in terms of the material used, it has changed from white tape to black net. Is there any reason for this change? -　Our main reason for this switch into Net objects was the wish to produce a more permanent floating landscape, since our Tape installation was by nature utterly ephemeral and very site specific.The colour black is simply the standard shade used for safety nets and it worked well in emphasizing gradients of visibility in the overlapping layers of the envisioned net-scape. We are, however, already contemplating the use of white or yellow-magenta-cyan combo nets in our future installations. This time, the exhibition will be held in tourist part of Yokohama harbor. Also, as part of the Smart Illumination, the artwork will be presented among other illuminations and as a night piece. With that in mind, how did it affect your creative process? Also, what is your expectation in terms of presenting in Yokohama? -　We really liked the idea of a "night-piece". Tape installations always looked best while illuminated and for Net to work in the same way we needed to isolate it from the surroundings, to create an artificial horizon and make the entire structure seem illuminated from within - which led to the construction of a completely new prototype for the Yokohama event - the Net Blow-Up. Through this process the initial Net became a self-standing, inflatable enclosure and acquired a new, outside aspect; a shadow-play of silhouettes on the translucent skin of the light bubble against the backdrop of the night sky. If you have anything in particular that you hope the audience to experience through your artwork, please let us know. -　We expect a good interaction with the visitors and a great opportunity for our new piece to serve as a proper community hammock to the people of Yokohama for the time of the Festival. Q3) What does “HIKARI” (which is “light” in Japanese) mean for NUMEN/FOR USE? Please feel free to make any comment. -　Hikari fascinates us but we generally don't tackle it directly in our work but rather tangentially - it was always latently important in the semi-transparent folds of the Tape installation, which has a specific quality of light where interesting diffusions happen in the layers of tape. 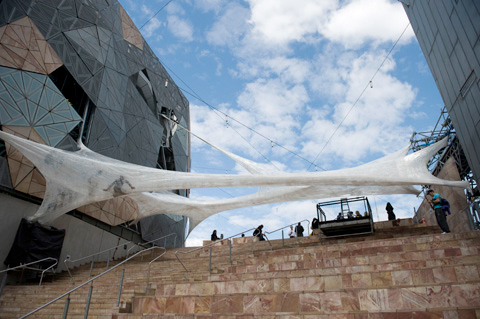 Net is also semi-transparent by its very perforated structure and plays with gradients of light permeability. We actually often work with membranes and transparency levels relying strongly on light and its refraction through materials.In our theater work we always conceptually start from darkness and light manipulation is crucial in the creation of the final image. One of our experimental objects, Numen-Light, has illumination as its essence, showing a slightly disturbing, infernal capacity of an endless light-scape. Q4) Do you have any messages or comments you would like to share with the Japanese spectators? -　We are very excited to be exhibiting in Japan (and Asia for that matter) for the first time, especially with the fact that we will present ourselves to this completely new territory and culture with two art-pieces simultaneously (Tape Tokyo and Net Yokohama). Since we find our own sensibility to be very close to the Japanese character and spirit, we are pretty certain we will be returning in the future.